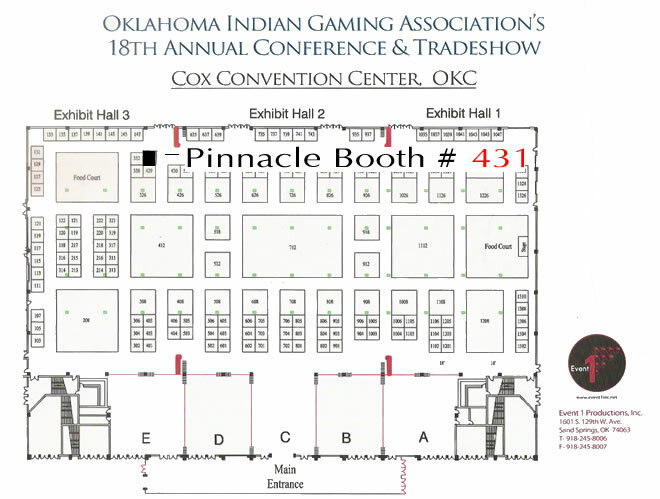 Come visit Pinnacle at booth #431 at the 2012 Oklahoma Indian Gaming Association’s 18th Annual Conference and Trade Show. It will be held the third week of August, 13th-15th at the Cox Convention Center in Oklahoma City, Oklahoma. Come see our newest designs and materials, pick up an updated catalog or a CD catalog. Hope to see you there! Click here to see the OIGA homepage. See below for our booth location.